Article in BRIGHT, November 16, 2016; Photograph by Arne Hoel/World Bank.French class at the Sogman primary school in Sejnane, Tunisia. I am the product of a very bold leadership decision. The first president of Tunisia, Habib Bourguiba, who came into power in 1956, decided to invest an expanded portion of the country’s gross domestic product in education. Many people protested — after all, what use could schooling be to a population without running water, roads, or electricity? 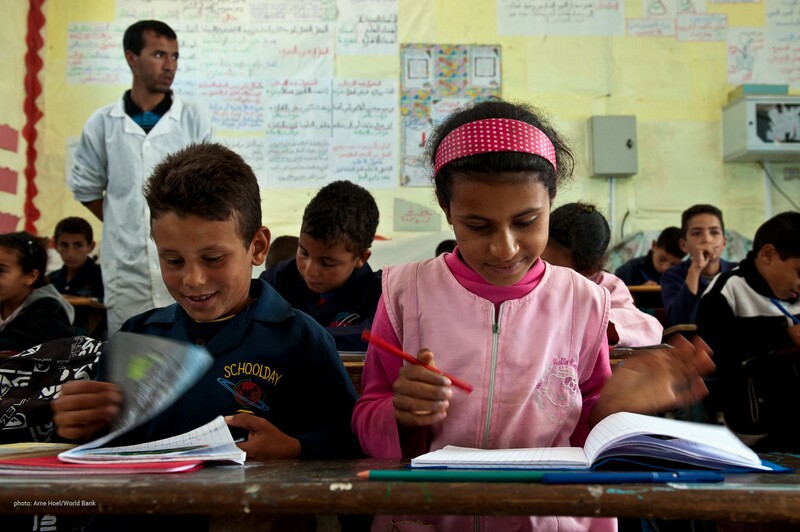 President Bourguiba’s priority was free, high quality education for every Tunisian child. Today, the world requires similar bold, education-centered leadership. We are in an educational crisis, and it is worse than we previously thought. Rather than making progress, we have been backsliding. The global number of out-of-school children of primary school age rose by 2.4 million between 2010 and 2013; twice as many girls as boys will never start school and multilateral aid for education has fallen over the past decade. Should current trends continue, by 2030 more than half of the world’s children will either not be in school or will acquire such limited skills that they will be utterly unable to compete in a job market that is becoming increasingly automated. By 2050, GDP per person in low-income countries would be almost 70 percent lower than it would be if all children were learning. What is more, the number of lives lost each year because of lower levels of education would equal those lost today to HIV/AIDS and malaria, conflict will be on the rise, and, in turn, we will continue to face unprecedented migration. Over the past year, I have been extremely fortunate to be part of a committed group of leaders who have come together to form the International Commission on Financing Global Education Opportunity. We refused to accept a doom-and-gloom scenario for the young people of our world. Our mission was to put forth a groundbreaking set of solutions to end the global crisis in education. What we found was clear enough: inclusive education — education that reaches every child, especially those at greatest risk of not learning, such as the poor, the discriminated against, girls, and those facing multiple disadvantages — is the central tool necessary to combat economic stagnation, political instability, conflict, migration, gender inequality, corruption, preventable illness, and inequality-fueled discontent. You would be hard-pressed to find someone who believed education should not be a priority. The problem arises when it comes to determining who will pay for it. Simply urging finance ministers to “spend more” will not result in any significant changes, nor would it be efficient. More money alone will not magically solve the world’s education crisis. So, in parallel, we must consider the impact of the money we are currently spending. Indeed, schools are the least reformed institutions in modern society, with teachers instructing on the same chalkboards used a hundred years ago — that is, when they are actually present at school. Though we are more informed than ever on what works in the classroom, up to 2 percent of GDP on education costs in developing countries does not lead to learning. Here’s a striking example: while evidence on the benefits of native-language instruction is strong, half of all children in low- and middle-income countries are not taught in a language they speak. Reforms must therefore focus on results to ensure that investments lead to learning. Research must translate to policy to ensure that resources are spent effectively, and on the right things. Improving the performance of current systems and putting results first must be a priority, along with transformations to unleash innovation and prioritize inclusion. Even if all inefficiency is removed in education spending, and even if national governments increase their budgets, we would still be unable to reach our goal of educating every child in the world without the support of the international community. Change is impossible without expanded financing for education. Unfortunately, educational aid has dwindled in the past few years, with global education aid amounting to as little as $18 per pupil per year in low-income countries, barely enough to buy one textbook. National efforts must work in coordination with international support. And so the commission’s report, The Learning Generation: Investing in education for a changing world, advocates for a “Financing Compact for the Learning Generation,” whereby countries commit to invest and reform. In return, these pioneer countries will be offered increased aid from the international community, creating a virtuous circle of reform, results, finance and success. And so this week, the Education Commission launched a “Pioneer Country Initiative,” bringing commissioners together with heads of government. Drawing upon the commission’s recommendations, these high-level meetings are designed to galvanize action as leaders commit to making education a domestic policy priority. In time, pioneer countries will demonstrate what is possible when leaders commit to investing in a “learning generation,” and their initiative will inspire simultaneous financial support from the international community. This financing plan is ambitious, but at the same time rooted in achievable targets of what is fiscally feasible and where changes can be made. If we act now, and with President Bourguiba’s unwavering vision exemplifying what it means to be a “pioneer country,” we can spearhead the largest expansion of educational opportunity in modern history. If we are able to build a global movement around education, we can ensure that the next generation is the Learning Generation. Amel Karboul is the secretary-general of MEF (Maghreb Economic Forum) and the former tourism minister of Tunisia. Bright is made possible by funding from the Bill & Melinda Gates Foundation. Bright retains editorial independence.